Leicester Secular Society is the leading organisation in Leicestershire advocating and campaigning for an inclusive and plural society free from religious privilege, prejudice and discrimination. opposing religious privilege and the promotion of any religion by the state. Membership of Leicester Secular Society is inexpensive and we have special household and concession rates. If you support our aims please consider joining us. Today, Leicester Secular Society members continue to be active in all aspects of society and in all areas of community life. We have members involved with environment groups, political parties, asylum seekers, Palestine Solidarity, TEDx, Skeptics in the Pub, cycle campaigning and Red Leicester Choir among others. 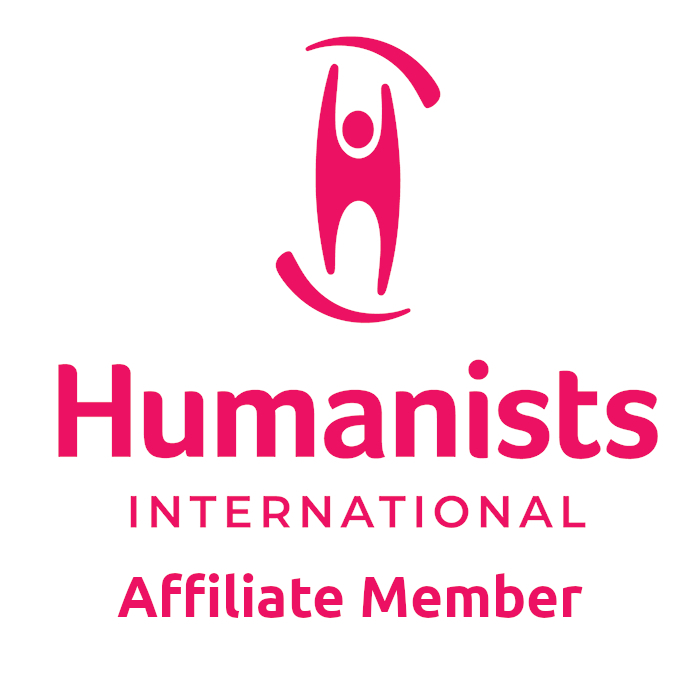 The Society is also affiliated to (but independent of) the British Humanist Association , the National Secular Society and a member of the International Humanist and Ethical Union. The Society aims to provide a stimulating atmosphere nurturing debate and creativity. Regular talks, meetings and events continue to be held at Leicester Secular Hall, one of the world's last surviving Secular Halls, built in 1881. The Hall and Society together provide a local base for loosely bound groups and individuals to join forces with a view to creating a better world. A fundamental principle of Secularism is rationalism and the pursuit of knowledge. The Society hosts a regular programme of informative talks on history, science, politics, poetry and art by local, national and international speakers. Recent highlights included talks on religion and Human Rights, ex-Muslims, under-nutrition in rural India and co-operation as part of natural selection together with a jazz evening and a feast. The talks are open to all, free (although we do appreciate donations towards costs) and run most Sunday evenings at 6:30 pm. We also host occasional events at other times. Please take time to look at our programme of talks and forthcoming events. Our (almost) bi-monthly journal is packed with topical articles and opinion, information and updates about our campaigns, reviews of recent talks and more. We also rather sporadically write a blog column - unsurprisingly named Leicester Secularist Blog. Browse the Leicester Secularist and our Blog. Secularists seek to eliminate the influence of religion on Government and Education and are committed to fighting religious prejudice, particularly in attitudes to sexuality, racism, immigration, womens' rights, abortion, and assisted dying. Key activities include contributing topical comments to the media, visiting schools and religious groups to talk about secularism, local campaigning against faith schools. We support the British Humanist Association in its work to provide alternatives to religious ceremonies and counselling. Read more about secularism, our current campaigns and non-religious ceremonies. For the past 160 years, Leicester Secular Society has provided a haven for the pursuit of knowledge, a shelter for free thought and radical politics, and a forum for literary, scientific and philosophical debate. The Secular movement in Leicester possesses a long and distinguished history; closely linked with the Arts and Crafts movement, workers self-education, and socialism. Since its inception in 1851, the Society has campaigned against the intrusion of religious power in politics and education and was instrumental in making atheism a respectable standpoint in Victorian England. Rather than converging on a particular political or moral consensus, the Society encourages freedom of speech and a spectrum of individual opinions. Society members are active in a variety of local campaign groups and autonomous organisations which support human rights and equality before the law. You can read more of our history here and on our archive pages. Leicester Secular Hall is home to one of the oldest libraries in Leicester, comprising five bookcases brimming with eclectic philosophical and political reading material. The Society has also published numerous books and pamphlets. Our archives are available for academic research and can be borrowed by Society members. For a list of available titles please view our extensive library catalogue. Have you done or been involved in - or just seen or heard - something interesting for local secularists? Email contact @ Lsec . org . uk (close spaces).